“Paintography- The 21st Century Works of Salvador Rosillo” opened Wednesday night at Salomon Arts Gallery in TriBeCa. 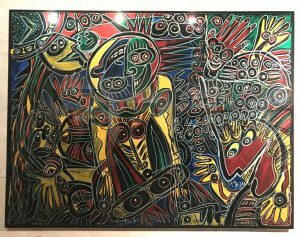 The exhibition showcases Rosillo’s vivid paintings from the 1960s. Alongside these are a series of prints produced using the artist’s signature paintography method. Below are several highlights from the exhibition, as well as my published press release. You have until June 13th to catch “Paintography.” Don’t miss this mesmerizing show! TriBeCa, New York: SALOMON ARTS GALLERY is honored to present “Paintography,” a selection of work by New York-based artist, Salvador Rosillo. 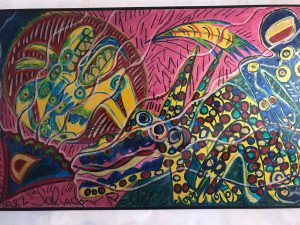 The outsider artist has long defied the art world’s expectations,painting with his fingers to achieve the impeccable intention of action. Doing so disrupts the brain’s decision-making patterns, allowing the artist’s childlike creativity to emerge from his subconscious. The process of paintography magnifies these childlike instincts, sharpening his paintings’ colors and exquisite details. Rosillo also looks to the historical implications of the line, drawing inspiration from calligraphy, Buddhism and Taoism. The combination of the childlike, the futuristic, and the art historical exemplifies the tension in Rosillo’s work. It cannot be categorized, and neither will he. Rosillo has worked at a gold company in Mali, and in the hemp industry in the United States. He is currently the Chief Executive Officer, President, and Treasurer of HempAmericana, Inc. He is a poet, a painter, and a philosopher of film. In his published book, Akira Kurosawa’s The Bad Sleep Well: Analysis, Drawings, and Diagrams, Rosillo suggests that light and shadow affect the audience’s ability to participate emotionally. The artist was a key figure in the TriBeCa and Lower East Side art scenes in the 1980s, experimenting with performance art, action painting, and gestural painting. The interdisciplinary nature of Rosillo’s life spills into his work. His paintings confront society’s tendency to categorize and isolate, offering instead an alternative: a series of juxtapositions that break the boundaries of the brain’s decision-making. These include the childlike and the mature. The intuitive and the researched. The artist and the capitalist. Judgement and acceptance. Thin swirling lines and dense blocks of color. In “Paintography,”these dualities become bridges. Thinking becomes an act, pulling information from both the subconscious and conscious minds to paint worlds that vibrate with energy.